If you are interested in one of our summer camp counselor jobs, all Shohola cabin counselors have duties in the cabin with the campers and also in teaching activities. Please list skills which you are able to teach while you are with us and the level of proficiency you have in those skill areas. The more you can teach, the more likely it will be that we can fit you into our team. 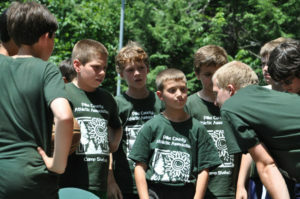 Shohola offers one of the best environments for summer camp counselor jobs in the camping world. We understand that time off is essential to keep counselors happy and well rested so that they can perform their very rigorous duties to the absolute best of their abilities. Shohola offers more time off than most camps, and even provides transportation for counselors during their free time, which is very rare. Our salaries are very competitive, if not higher than most camps in the area. Shohola also has a computer lab for counselor use and many areas around camp are wi-fi hot spots. The memories and the friends you make at camp while doing your summer camp counselor jobs will stay with you forever. Even more importantly, the memories you help make for your campers will stay with them forever and will impact their lives in a very positive way.